I am just setting up a new part-time bakery, so the web site is a work in progress. Visited your site and just found this blog. I have a similar intention only bake at the weekend and only the bread I want to bake. I am a bit confused. Have you written a book? When will it be available? I would love to purchase a copy. Nice to hear from you Martin. Like the sound of “only the bread I want to bake”. There’s certainly nothing I could tell you about setting up a bakery. There are now two books, the big book and the little book. The big book is what I was writing earlier in the year in France. It attempts to describe how I got into baking and the journey to setting up the microbakery, how it works, and finally, the recipes in the repertoire. By the time we got back I have written everything except for the recipes. That sounds silly but all the recipes are in spread sheet formulas and can be easily written up as and when I have time. When we got back I sent the draft off to several friends and acquaintances for comments. Some loved the autobiographical elements and some hated them. A number also asked who the book was aimed at. So I sat down and wrote the second book, Bethesdabasics, which is a straight-up-and-down introduction to sourdough, how to make a starter, bread making techniques, followed by thirteen recipes – campagne, classic, wholemeal, multigrain, five seed, baguettes, tomato bread, russian rye, parmesan & courgette flatbread, brioche au fromage de brebis aux figues, pizza, wheat tortillas,and red grape and fennel seed foccacia – the idea being to demonstrate the range of breads that can be made with sourdough. This is just finished and I’m trying to work out how to market it. I shall probably start off by tryng to flog it as a pdf file over the net – soon as I can sort out Paypal. The other option would be to have it printed as it’s only around fifty pages long. The trouble is I would have to stump up to have a thousand printed before it started to be economical. Any ideas? 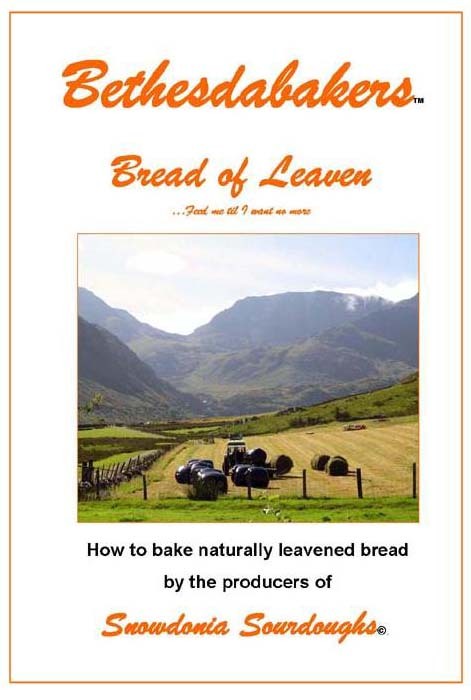 Have a look at Nils blog – ye olde bread blog – seems we arrived at the same stage at the same time. Quite apart from publishing agents, there’s a surprising number of self publishing resources out there, in particular, web based services like lulu.com where you upload the product, they print off, collect payment, send to the purchaser, and pass you your payment. You’ll need to to your own economic evaluation, but it’s worth considering. I would buy it, Mick! Wish I had more time to develop enough recipes myself but seem a little too hectic keeping up with demand for what we already bake! Why not send it to a publisher too? I’m checking out lulu, Gareth. At a first stab it seems a little difficult to work out what the costs will be but I’ll have another look. Time is the thing, Andrew. My output is just a little smaller than yours, but it eats up the week. I have sent it to one publisher, Jeremy, but I should have prepared the ground better. All of these things I will do.